Gwen Morris passed away peacefully on November 10, 2018 at the age of 96. A Celebration of Life Service will be held on Saturday, November 17, 2018 at 12:00 Noon with visitation two-hours prior at Hope Lutheran Church in Jordan. Pastor Steve Thompson will preside, and Gwen’s grandchildren will act as pallbearers. She will be laid to rest at Spirit Hill Cemetery in Jordan. 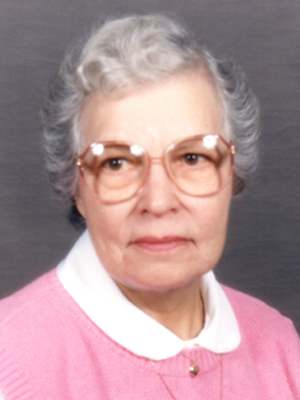 On April 1, 1922, Gwendolyn Theresa Nicholls was born to parents Noble & Eva (Leibold) Nicholls in Warren, MN. She was the second youngest of nine children. Gwen had a rustic childhood growing up on a farm in the Red River Valley of Minnesota. She developed a strong work ethic at a young age. She helped herding the cows and raising chickens, geese and turkeys. As a girl, Gwen was active in 4H. This is where she learned to sew, garden and bake. She also joined the 4H kitten ball team. During her childhood Gwen enjoyed riding horses on the farm. She and her mother had horses named, Gypsie & Midget. Gwen attended Cook Schoolhouse through the 9th grade. She would have loved to further pursue her education, but her family couldn’t afford to send her to high school. Instead she began working on the farm to help support her family. During this time, she met Daniel Morris. Gwen and Daniel were married on December 10, 1941. They quickly started a family and were blessed with six wonderful children, Irene, Jerry, Jim, Dan, Bob and Julie. The Morris family moved around a lot in their early years. They farmed land in northern MN and ND before settling on a 47-acre farm in Gonvick, MN. They were a hard-working family and had a good but simple life. While in Gonvick, Daniel started a plumbing business. Gwen was a homemaker and even babysat for local families. When she wasn’t working, Gwen pursued her hobbies. She taught 4H when her kids were involved, and she was everyone’s favorite leader. Gwen was an excellent bowler and was in leagues for many years. She enjoyed square dancing and kept the most beautiful gardens. In 1969, Gwen and Daniel moved their family to Jordan. Along with their oldest sons, they purchased a 10-acre plot of land. At this point, Gwen’s older children had moved out of the home and were starting families of their own. Gwen & Daniel took their younger children out to California to visit family. They also saw the Grand Canyon and many other National Parks on their family road trips. In 1977, Gwen and Daniel went their separate ways, but they always remained on good terms. While in Jordan, Gwen began working outside the home. She worked for many years as a machine operator in the manufacturing industry. Gwen also had part time jobs at local garden centers. She loved being around all the plants and flowers. When she finally retired, Gwen pursued her love of travel. She took many memorable vacations with some of her favorite trips being to England, Maui and Costa Rica. Gwen spent the later years of her life in Prior Lake. She loved being at home with her cat listening to Elvis. She eventually moved into All Saints Senior Living in Shakopee where she received wonderful care from the kind staff. Throughout her life, Gwen set a wonderful example for her family. She was gracious and kind-hearted. Gwen loved her family deeply and was so proud of all them. Gwen will be remembered always by her children, Irene Leiran, Jerry Morris, Jim (Sharon) Morris, Dan (Trish) Morris, Bob (Nora) Morris, Julie (Mike) Betchwars; her grandchildren, grandchildren, Kim Espinosa, Joni Allen, Dawne Dalzell, Bryan Leiran, Patrick Morris, Tiffany Rapplean, Wade Morris, Nathan Morris, Christopher Morris, Scott Morris, Dawne Wermerskirchen, Teresa Weiss, Cynthia Weir, Jake Morris, Lauren Jepson, Jennie Tacheny and Sarah Betchwars; many great- & great-great-grandchildren; sister-in-law, Mary Ann Nicholls; nieces & nephews; other loving relatives, neighbors and friends. Gwen was greeted in Heaven by her parents, Noble & Eva Nicholls; ex-husband, Daniel Morris; daughters-in-law, Sherry Morris & Kallene Morris; son-in-law, Wayne Leiran; siblings, Lorna Kosusnik, Roland (Norma) Nicholls., Vivian (Dave) Heller, Iola (Elgot)Larson, Irene (Oliver) Rousseau, Daphine (Oscar) Olson, Robert (Edythe) Nicholls, James Nicholls. We are so sorry for the loss of your beautiful Mom. Please know our hearts and prayers are with all of you!